GPLv3 - Is it right for your family? The GPLv3 came out a while ago, with a changed outlook from v2, which upset many people, with some choosing to relabel their software from being GPLv2 or higher to GPLv2 only. From what I gather, the intent of this paragraph was to define how the GPL affects hardware manufactures that embed GPL software on their products. They wanted to allow companies to ship various software together, as long as the user of the product doesn't have any legal restrictions applied to them. For example: By opening this package you forgo your rights to ever resell the contents within. Or: You agree to not use this product in order to reverse engineer it. Or the real clincher: By opening the packaging or using this product you agree to not attempt to modify it. Now under the GPLv3, one is unable to sell hardware with GPLv3 on it to someone which somehow limits their legal rights they had prior to owning hardware. Now what exactly defines legal rights? One's legal rights change from location to location. One has legal rights and restrictions based on the country they live in. They also have legal restrictions added on to those by the state they live in. One who owns a domain may also limit the rights of those who wish to stay within their domain. When one lives in a domain, and violates a law of that particular domain, they may be punished by the rules of that domain, as long as the punishment isn't in conflict with the rights and restrictions provided by the domain that particular domain is contained within. Meaning, I can establish rights and regulations within my own household that are binding to members within it, as long as it isn't in conflict with the state I live in. The state can do the same as long as it doesn't violate the laws of the country it is in. Although not normally thought of in that sense, my home does have legal rights, restrictions, and regulations that I apply to my household. I don't allow coloring on the walls. If one does so, they know that their crayons will be taken away, and they will lose allowance for the next two weeks or perhaps certain video game privileges, depending on the age of the perpetrator. Now in the past, if I wanted one of my children to have a computer, I'd buy/build/whatever a computer, and install all the necessary software I think they need, as well as any other software that they desire that I don't deem as contraband. However with the GPLv3, if I compile together components for a computer, as well as various software into a nice personal computer, if any of the software is GPLv3, I can't restrict any other previous legal rights to the user of this personal computer. Buying children expensive gifts have always been a form of negotiation and a method to apply new restrictions on troublesome issues that have recently come up. For example, if my daughter recently decided she wanted earings, but her mother and I decided we don't want her to get her ears pierced right now, we'd try to negotiate the restriction. If we knew she also wanted a nice new laptop, we'd perhaps buy her the laptop, but make a deal with her, that if she uses this nice new pink Eee PC, she no longer asks her mother and I if she can have earings until she is 16. This way she can be content about having a new computer, and wont bring up her desire for earings for a few more years. However, if we got her an Eee PC with Linux installed with several GPLv3 apps, as opposed to the Windows preinstalled Eee PC, we would not be allowed to under the terms of the GPLv3 negotiate this agreement with our daughter. It seems because of the GPLv3, I can't give my children anything but Windows on the computers I buy for them, if I try to use them as a bargaining chip. Before you Mac lovers pounce on me, please recall that MacBooks today come with GCC, which is GPLv3. Thanks to the GPLv3, it seems now Windows is the only Operating System that is right for your family. Remember also to be careful which open source applications you preload with, to make sure they aren't GPLv3. Binary Trees - Does it matter? Ever programmed a Binary Tree before? If you took computer science classes past an introductory level, you probably studied the theory before. But to what extent do decisions matter? To review for those of you who don't quite recall what a binary tree is. You have a series of nodes, each node contains data, some or all of which is the key, up to two pointers to children nodes, and possibly other meta data. 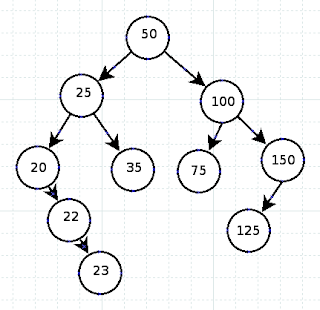 The most popular type of binary tree is the Binary Search Tree, where each node conceptually has nodes with lesser keys descending on the left, and nodes with greater keys descending on the right. How to implement a left and right can be done with two node pointers called left and right, lesser and greater, an array of two node pointers, or any other method which makes sense to you. All operations begin with the topmost node in the figure above, known as the root, head, or top node of the tree. 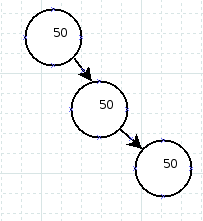 To find a node with a particular key, one compares it against the current node, if it found it good, otherwise, if it's less, take the left route, otherwise the right. If there is no path left or right as requested, since there is only a null pointer there, then a node with a matching key is not in the tree. 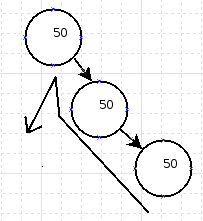 At each node reached, the same algorithm is applied. In this instance, a Binary Tree is very similar to Binary Search, each check effectively cuts the data in half, leading to very efficient searches. Adding data to a tree is very much the same. The data is encapsulated in a node, which again goes down the tree finding where the data should belong, in this case, once a null pointer is encountered while trying to traverse the tree further, it is replaced by a pointer to the new node. Deleting data can be a bit trickier. If a node has no children, deleting a node is quite straight forward. If the node only has a path left or right, one simply cuts out the node being deleted, and makes the pointer once pointing to it now point to the child. However, for removing a node which has two children descending from it, there's a number of methods that can be applied. The simplest method is to make one child a replacement, and add the other child onto the child replacing, meaning add the left node to the right or the right to the left. Look what happens when deleting the root node, which in this case has two children. The node with a key of 50 is deleted which had two children, 25 and 100. Either 25 becomes the new root, with 100 as the rightmost of 25's descendants, or 100 becomes the new root, with 25 as the leftmost of 100's descendants. 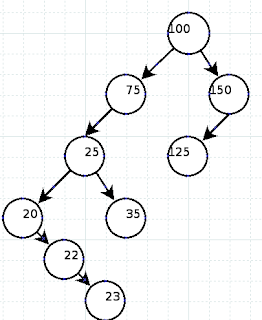 The only problem with this algorithm is that it can quickly make the tree become unbalanced, degrading into a linked list. 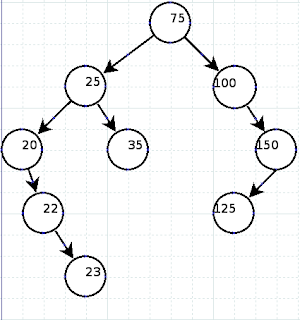 A tree should be as close to balanced as possible, so search or addition can be done with cutting half the tree out per each node looked at. 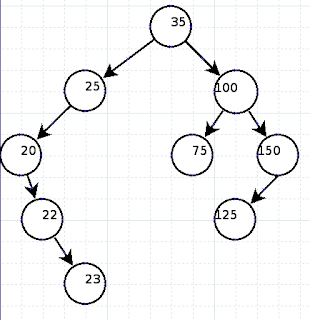 An unbalanced tree would make each operation generally consist of looking at most of the nodes in the tree, which is inefficient. Therefore, the generally proposed algorithm is to find the next or previous node by key, and move it to replace the node being deleted. First lest us understand tree order. A binary tree can be processed in direct order using the following algorithm. Which is plain English means handle left, then current, then right, in a recursive fashion. 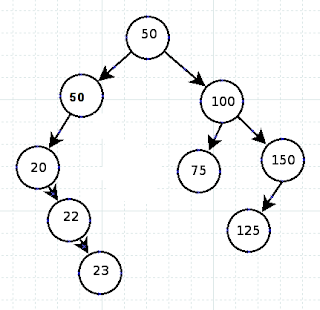 Because a Binary Tree can be processed in this fashion, in addition to being a nice data structure, it can also be used as the basis of a sorting algorithm. All data is encapsulated in a node and is added to the tree, then it is traversed in order as just described, placing the data back into the original data structure, and then the tree is destroyed. Now understanding this, the node prior to any particular node in regards to its key is always one left, and then rightmost, and the node after a particular key is one right, and then left most. 50 is deleted, and the previous or next one takes its place. In this case, 35 being the previous, and 75 being the next one. Now to get to the meat of the article, does it matter? Does what matter? First off, we didn't at all mention how to handle nodes which have equivalent keys. Back when I was in college learning computer science, we were told to just throw it down the right or the left, but be consistent about it. Also, when it comes to deleting, take the previous or the next, but again, it doesn't matter, as long as one was consistent about it. Or perhaps in this latter case, alternate sides per delete. But the question we must ask is: "Does it matter?" And the answer which they at the very least didn't teach me when I was in school, yes, it does matter! When one sorts, one can do a stable or an unstable sort. Stable means that if two elements had equivalent keys, when sorting, the order of those nodes would be preserved. Meaning if we had: "50 C, 45 A, 23 C, 50 B, 75 D, 50 A", and the numbers would make up the key, but not the letters, then it would sort to: "23 C, 45 A, 50 C, 50 B, 50 A, 75 D", keeping the order of C,B,A among the elements with a key of 50. Unstable would mean that the relative order of those 50s is not guaranteed to be kept when sorting. 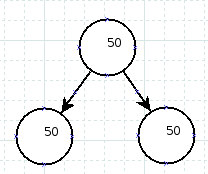 A binary tree can only be used as a stable sort if equal data is always placed on the right side. This is because the order of succession is left, current, right, and if it was placed on the left, it would mean the node added later came before the current node. However, just putting equal data on the right isn't the end of the matter yet. Most good Binary Trees, such as a Red & Black Tree will implement some kind of self balancing system, so areas which are starting to become linked lists rotate to become balanced trees. As can be seen in the diagrams, the middle node of the three becomes the new parent of the section with the first node becoming the left. This still follows the in order rules of left, center, right, because the one of the left is indeed the first node. And rotations like this, would also preserve numbering orders of the keys (otherwise a Red & Black Tree or another self balancing tree would never employ them). 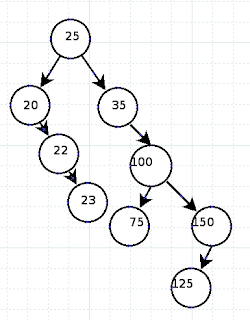 Now adding another 50 on our proposed case still works with our initially stated algorithm, we traverse down till we reach our area of 50s, then place it to the right of the right most one. However, we have to slightly rewrite our find a node which matches a key algorithm. If we want our tree to always return the first node which matches a key, or in the case of deletion, delete the first node which matches a key, one can't just search until one finds a matching node, since it in fact may be the second or third node if rotations took place. Rather, one has check to see if the left contains the same value, and if so, go left most across matching keys, and return the deepest one found there. Now after reviewing these revised rules, is your binary tree written properly? Furthermore, have you ever even seen an implementation which when searching checks left most for matching keys? Oh, and before we leave, what about deleting, does it matter if the prior or the next node is chosen? The other night, a student of mine asked me that, and presented to me a case which we both agreed proved that to properly delete and keep a stable sort, one has to use the next node, and not the prior one to properly preserve the key order. Although, we were both tired at the time, and now when trying to recreate the case I can't seem to do it. So I do hope I was in error the other night, and am not leaving out a crucial point. If you happen to know of a case where it matters, please describe it in the comments. So who here loves Mozilla and their browsers such as Firefox? I do too, but am I the only one finding Mozilla turning more into Microsoft every day? To start off, lets point fingers at the memory issue. Notice how Windows' memory requirements have gone through the roof? Yet comparable desktop environments and windowing systems from other sources seem to be just as advanced as Microsoft's latest offering and don't use a fraction of the RAM. I'm told KDE 4 runs comfortably with only 512MB of RAM, and you can even get away with 256MB, while a friend of mine running Vista started with 1.5GB but said he had to add another 512MB so the system didn't get all slugish on him. Does Vista offer anything special that KDE 4 doesn't? Compare that to Firefox these days. I open up Firefox with two tabs, one in a pretty ordinary text page with a single image on it, and another with some tables and a form, and it uses over 400MB of RAM. When mentioning it to Mozilla, they of course tell you it's a feature not a bug (sound familiar?). What feature exactly needs all that RAM? I'm told some nonsense about how it caches previous pages one went to, so they load quickly when you press back. Considering I just opened the browser, which pages is it caching exactly? To further compound my bafflement of the issue, I even disabled that feature in about:config, and yet Firefox still eats a ton of RAM when I open it. I used to run Netscape Navigator on a machine with 16MB of RAM, and two whole browser windows opened, and it didn't eat a fraction of the RAM Firefox does now (and this was before Windows had virtual memory). Heck, even other web browsers such as Konqueror and Opera don't use that much. Well, now you'll tell me, but at least Firefox started the whole standards revolution right? At least it's better than Internet Explorer, right? While it's true that it's better than IE, I wouldn't even consider IE a browser, as it can't even get basic standards right. If you had a program which edited text files, and you have it open a file, and it comes up with paragraphs out of order, and some not even appearing, would you call it a text editor? Yet I'm starting to see Gecko (the engine powering Firefox and Seamonkey) go the same route. Try setting a background for a radio button with CSS in Firefox, it completely ignores it. Yet even IE, the non-webbrowser, can do CSS backgrounds for radio buttons (albeit it only changes the background color outside the radio button itself within its rendering square). Then there's the issue about how Mozilla is trying to make their browser the only platform out there. Why do most people today still use Windows, even when there's a better OS for the average person? It all boils down to the applications. Anyone who is proposed to switch asks, can I play my favorite games on this other OS? Does my digital camera's photo sorting software work on it? What about all the other applications that I use on a regular basis? As Microsoft's chief primate keeps yelling, it's all about the developers. People will be stuck using whatever runs their favorite apps. Now of course we know that the internet in many ways is becoming the new platform out there, hence why Microsoft tried to crush it or control it all these years. So as long as your browser is standards compliant, if people develop for it, we should be okay, no? Unfortunately it's not like that. GMail doesn't work on Konqueror unless Konqueror changes its user agent to report as Gecko. Meaning many sites lock out browsers just because they didn't test with them, not because it doesn't work for any particular reason. A similar problem exists how IIS servers gibberish to browsers reporting themself as Opera. Yet Microsoft only wants to keep it that way. Recently Microsoft reported that the upcoming IE 8 will only go into standard compliance mode when websites include an IE8 tag in their code. Now most people who discussed this feature have totally missed the main problem. It's not about having to add an extra tag. It's that the default mode for any whacko out there writing a webpage is to render in IE 6 or IE 7 super-bug-filled-non-standards-compliant-mode, so webpages will continue to not become standardized. Of course Microsoft realizes this, they'll do everything they can to make sure the large majority of stuff coming out by the clueless masses only works on their platform. Now I'm not talking about Mozilla making the web buggy like Microsoft is trying to (but I bet they'd like that if they could get away with it), but it's that they're trying to get people dependent on their web browser. How so? It's all about the extensions! 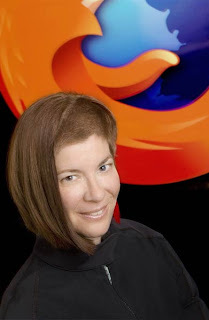 Mozilla invented their own language and format and ranted and raved about how everyone should be writing extensions for their browser, and how their browser is the de-facto standard of the free world. How many of you using Firefox feel they need all kinds of extras that people write for it? How often do you sit down at someone else's Firefox and feel naked about a lack of certain features you tailored your browser back home or at work to? Now while I could go on and on about all kinds of extensions, everyone has their own tastes, so it'd be pointless to, but I'll point out a couple of examples. Some of the extensions I use regularly for Firefox, such as auto translations of pages in languages I don't read/speak, or user agent spoofing are built right into Konqueror, many others aren't available anywhere else, or only for certain browsers written specifically for them. I'm talking about the GMail/Yahoo/And whatever else e-mail notifiers that can tell you when you received new e-mail, or ForcastFox which can tell me mostly accurate weather info for the week for just about anywhere in the world. Now these extensions I just mentioned are perhaps not anything to get addicted to, but what about Ad blocking? Now of course other browsers also have a Mozilla compatible ad block framework installed, how many of them allow you to install something like the "Filterset.G Updater" so you can have your blacklists automatically updated by others to hide all the new types of ads on the internet that come out, such as the "Download Firefox Ad" that appears on the right of this page? Am I the only one who now feels locked into Firefox and can't switch because their special browser software doesn't run elsewhere? Even when we realize what a horrible wreck Firefox is, and terrible on machines with little RAM available? Notice how his own personal desktop is the default Windows XP background? 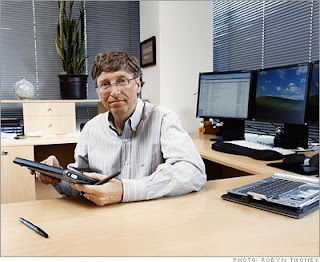 Surely a man as technical as Bill Gates can figure out how to change it to something he enjoys, just like everyone else has. Or perhaps Bill Gates never changed it, since the default Windows XP background was Bill Gates' personal background at the time? Of course leave it to a guy like him to force his personal desires on everyone else. Now lets see how Mozilla does the exact same thing. Ever wondered where Firefox's logo came from? Who would think that an image of a fox conquering the world is a good logo for a browser? Now what do you think came first, the Firefox logo? Or her ridiculous hair cut? If you think you can point out how Mozilla isn't the Microsoft of the internet platform, please let me know, I'd love to hear how you came to your false conclusions. Say goodbye to the former Qt and hello to MiniQt? So everyone knows that Nokia is looking to buy Trolltech, the company behind Qt right? If not, read the press release. Trolltech also has up a list of what this means for everyone, as well as a letter to the open source community (rename it to .pdf). Now after hearing all that, you're probably running in one of two directions. Either thinking that "oh no, my Qt has been taken over by an evil organization and it'll be destroyed! ", or that "KDE and Trolltech have an agreement over Qt so we're safe!". The interesting point is that both are true. What? Both are true?!?! How can that be? First, a little background. Qt which is the foundation of KDE, and what all the pillars of KDE stand on, is pretty much irreplaceable. Not wanting to ever get bitten by developing such a massive project on such a foundation controlled by a company, KDE and Trolltech signed an agreement, and formed a new group called the "KDE Free Qt Foundation". To fulfill the purpose of the Foundation, an agreement between Trolltech and the Foundation was made. 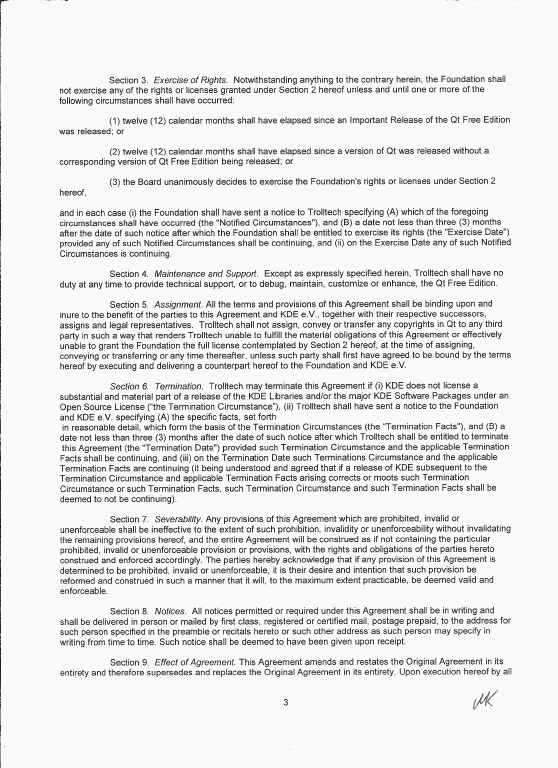 This gives the Foundation the right to release Qt under a BSD-style license in case Trolltech doesn't continue the development of the Qt Free Edition for any reason including, but not limited to, a buy-out of Trolltech, a merger or bankruptcy. As for the latest agreement, you can find links to it on their site, but the primary part to worry about is this. Let me summarize. If 12 months have passed without seeing an open source release of Qt, or the open source version falls behind the closed source one in that period of time, or the board as a whole (which half is composed of by Trolltech) agrees to release Qt as BSD, then it shall take the latest open source version of Qt, and open source it under the BSD license as they will become legally able to. Now one must wonder why is that important? The current release is under GPL2/3 anyway, why do we need to have it stuck under BSD? We can always continue using the latest release as GPL2/3. The great thing about Qt is that they have a corporation backing it, making sure the toolkit is excellent. They pay employees to do all the dirty and annoying work in the library too. They also ensure that it remains portable on a large variety of hardware. This kind of heavy work is not something the open source community is usually able to coordinate too well. There are very few large open source projects that are fully portable, run on greatly varied setups, and cover areas that most people don't want to program for. For example, Ubuntu made a release a while back where a significant portion of printer support was broken, since it's not fun to test or fix, there's nothing really challenging about printer support (except maybe getting those annoying devices to work in the first place, and not paper jamming), and it's not cost effective to make sure it continues to work, and the "save the universe, time, and pluto" groups wouldn't like you using all that paper either. Also, Qt is currently able to be gotten either via a proprietary license or under the GPL (with exceptions too! ), so companies producing closed source software, and open source nutjobs can play on equal footing. That means when a company hires a developer to develop with Qt, it's the same Qt, so s/he can later go home and use his or her knowledge to write a cool new open source application involving giraffes e-mailing pictures of people with dyed hair around, or whatever s/he might fancy. It also means that open source developers who want to create their own startup company, can use the knowledge they already gathered to write terrific applications, since they can just go and buy some licenses, and write their new apps. The "Poison Pill" that they signed on would put Qt under BSD, which would continue to allow the companies, and the communities to continue to work with the same software, in the event that Trolltech became evil (or by extension of being bought). It could also mean that a company could throw developers at Qt, and use stuff privately in their own products too, and not be forced to not be allowed to do anything with their own changes, since it's virally all GPL. This all falls apart however when one considers precisely what is in the agreement. IFF ('If and only if', for those of you who missed school that day), Trolltech or the new company fails to deliver an open source version or equal to the version offered proprietarily for an extended period of time, they can BSD what they have. This is great as long as the evil company doesn't continue to offer something which is worthless to the community but not so to the companies. Lets step back and think for a moment what Nokia is interested in. Cell Phones, right? Meaning only Qtopia, Qt in itself is worthless to them. Also consider what Trolltech's primary business is. They advertise these applications as the coolest using Qt. How many of those applications are done by those who buy a license? Now once you figured that out, how many of those have anything other than a Windows build? Many companies use Qt, not for the portability, but because of how easy it is. Here, read what Adobe, a company who has never produced Linux software, has to say. Since companies use it for the ease of use, and speed of development time, and don't really care if it works on Linux or not, since we all know that those Linux guys don't buy anything anyway, why should Nokia bother continuing to develop the X11 port of Qt? It's just a waste of time for any normal business model. So Nokia could continue to develop Qt for their cellphones, and for customers such as Adobe, and even release Windows only, or perhaps even Windows and Mac OS X builds of Qt both proprietary and under the GPL, but none for X11. And what can the "KDE Free Qt Foundation" do about it anyway? Their agreement is worthless as there can still be an open source version which won't be useful to most of their developers. And who in the world are they going to complain to about 'intent' of the agreement? KDE runs on Windows and Mac OS X now, right? Their petty foundation can continue making their Kool Desktop Environment as long as it's done on Windows right? No one is stopping them. At this point, the companies and the communities can be fractured, and even worse if the library is very different one platform to the next, it will become completely worthless for the sake of portability. Having an unfunded fork off of an older Qt won't do as well either, just look at what an awful mess the crippled broken GTK is, even with it being LGPL so companies can use it - if they were drugged up enough to. On the other hand, Qtopia does run on Linux, but isn't protected by the KDE foundation either. If Nokia for whatever reason continued releasing Qtopia under open source, and the X11 port died, but cool new features of equal footing came to the Windows/OS X/Qtopia ports, perhaps the community might get some movement in the direction of moving away from the horrible X11. Bleh, who am I kidding, the nightmare that is X11 is here to stay, right? So KDE 4 is out, along with major architectural changes, a new face, and new software, as well as tweaks to what KDE 3 had. Now if you wanted to know about all the new libraries, and new platforms supported, or kinds of other flashy changes they made, you can look elsewhere on the internet. Instead I'm going to just describe the changes to the standard file open dialog, and the ramifications of having Dolphin as the new file manager, keeping in tradition of the previous file dialog articles. 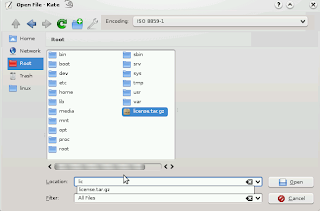 First big difference is that the KDE 4 file dialog now has a crumb view on top. The crumb view is nice, in that if you want to jump back up a few directories, you can do so in a single click, instead of pressing up multiple times. In fact you don't even need an up button anymore, but don't worry, the design experts at KDE gave you one anyway, since space on that line isn't important. Because if it was important they might consider moving the encoding drop down elsewhere - oh wait they did do that. You've got to love mixed messages when it comes to GUI design, they needed more room for the crumb browser so they moved the encoding elsewhere to take up a full line down below, yet leave in the up button. Also interesting to note that KDE 4 is now using Qt 4, which quite nicely offers a file system watcher for paths to tell when they get updated to automatically refresh a file view, it seems despite that, the KDE team thinks you also need a nice refresh button on top. Now there's plenty of room for large paths for the crumb browser, and no ridiculously huge encoding selector. But these obvious issues aside, we haven't even gone past the surface of how utterly useless the dialog has become. Remember how I spoke about how Windows added annoying virtual locations? Seems KDE copied them down the last annoying detail. Now "/home/insane" appears as "Home" in the crumb viewer (and no absolute path anywhere). If I want to go up to "/home", and then "/home/spouse", it's impossible. "Home" is treated as a root path, even to the extent that the unneeded up button doesn't do anything at this point either. One has to click on the left on "Root", then select "/home". This gets worse if you're on a machine where home directories are stored several levels deep. Of course power users, can type in the full path in the location bar on the bottom, but you'd think a group as intelligent as KDE can avoid glaring Windows design flaws. Don't even get me started on what happens if you delete the Root button from the quick locations on the left. Poor users who want to find someone else's home directory now have to navigate through the root path filled with stuff like "usr", "opt", "bin", "srv", and other unintelligent gibberish to do something that once was a single button click. And speaking of annoying locations. Why the heck is Trash a location that appears by default in the quick locations? How often do you decide that the document you need to open is in the trash? I'm glad they removed Desktop, but replacing it with Trash? What were they thinking? Give me something useful like a Media quick link, for optical drives and all kinds of USB/Firewire external memory devices. They also completely removed support for right clicking on the quick locations panel, and just adding a new quick location. Now one is forced to drag a directory's folder icon from the right to the left. I wonder how that will work if one is in some kind of virtual directory that has no parent, making it impossible to drag. Anyways regarding other features, remember how KDE 3 gave the user a lot of power and allowed them to have something similar to the old Windows 3 split view? For some reason this useful method to navigate your files is completely gone. And now with the old location input bar merged into the one for files, I can't even easily edit the current location by hand, since it doesn't display the current path at all. Furthermore, entering a new path seems to make it have useless data left over in it like the last path directory component after enter is pressed. I guess making the perfect file browser, especially when you were almost there is next to impossible. Speaking of file browsers, lets look at how the new edition of Dolphin fares, touted as being better than Konqueror for simple management of files. Now I remember I complained to some KDE devs a while back regarding the KDE 4 betas and how Dolphin seemed to be a bit brain damaged at file management, but they assured me it would change for the final release of KDE 4.0, and change it did! For the worse. Back in the older betas, one could click a button to bring up a full path editor instead of the crumb view, now that button is completely gone. To bring it up, one has to go browse through one of the menus on top to switch back and forth between the quick browsing methods. Here too, they also kept the brain damaged virtual Home path. There is no way to go up. Nice to see they didn't put in a useless up button, but here again, if I want to see everyone's home directory, I have to navigate there from Root. 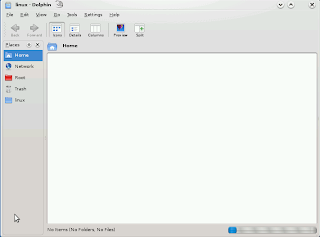 Also, if one switches to the classic path editor, if one wants to go up, they're forced to backspace the old path, or switch back to the crumb view, since in the KDE Dolphin developers' great vision, they couldn't stick both views in at the same time, or make an up button appear when in the classic path editor. 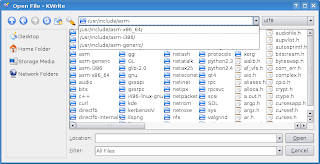 And in keeping with the new KDE 4 design goal of copying stupidity from Windows (Vista), when viewing the tree view, the file viewing pane is also filled with now redundant directory listings. Isn't it wonderful to see how people who used to be way ahead of the curve and tried so hard to offer a really advanced product have completely fell between the cracks when it came to normal sane usability of files? For those of you wondering if perhaps GTK got any better since the last time I reviewed it, you can rest assured that it has not. In fact, I now have a new refined hatred for how lousy GTK is. 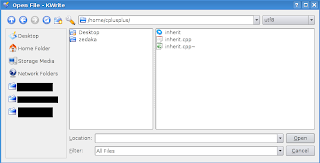 In the course of uploading some images from FireFox in an article I was writing, the GTK file menu had the file type filter locked to (*.png/*.bmp/*.gif/*.jpg/*.jpeg). Since the pictures I had were all *.JPG, none showed up, as GTK in their infinite wisdom made the extension filter case sensitive. Seems UNIX file management is just as lousy as ever and getting worse. I'm afraid to even look at Konqueror in KDE 4, fearing they ruined it too. Feel free to start a flame war in the comments, I got my flame retardant suit on, besides nothing you can write can make me feel worse than what a downgrade KDE went through.